This review is written by Robbie Morrissey. There is only one word to describe this game; Mad, absolutely mad. Grab your Game Boy Advance and get ready to be thrown into a world of absolute randomness. 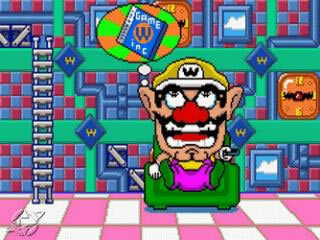 Wario Ware Inc Mini Game Mania is as the title suggests a game full of Minigames , it was released by Nintendo for the Gameboy Advance in the year of 2003. The gaming is nothing more than a rapid succession of the most basic gaming challenges , but it is how they are linked together that makes this game what it is. At first glance Wario Ware Inc seems a simple and uninteresting game, but as I was soon to find out it could be nothing further from uninteresting. The story told in Wario Ware Inc is not one of the easiest to understand, but what I got from it was that Wario is attempting to make money by setting up a video game business. Players must make there way through each character in the Wario Ware world completing the challenges that are thrown at them. Each character has their own preferred style of Mini Games to dish out, 9 Volt for instance giving you 5 second nuggets from classic Nintendo games to go against. Whereas Kat offers up Nature based Mini Games. After clearing a certain number of Mini Games depending on the Difficulty of the level the player must win a ‘Boss’ game in which the player must defeat a Mini Game that has 3 levels increasing in difficulty each time , which gives a nice touch to finish off the stage. The only controls utilised in the game are the D Pad and A button, at first this may seem too simplified and unchallenging, and however as the game progresses you begin to see why this only adds to the addictive and attractive game play. A feature which I very much enjoyed in the game was the Bonus Games that became unlockable after attaining certain scores in certain categories. Games such as Paper Plane or Rope Jump became almost as fun and mad to me as the 200 minigames found in the central game, and kept me attempting for hours to beat my high score. This overall gives a feel of a game of seemingly large size when in fact it is a very ‘mini’ game. Intertwined with the mini games are little animations. When coming into a game full of mini challenges it would not be entirely fare to expect lush graphics and a fine tuned soundtrack. But it continued to surprise me that the graphics and sound in the game effectively enhance a game that is both addictive gameplay wise and beautiful to cast your eyes upon. With graphics superior to many GBA titles even though challenges last a few seconds the classic Nintendo challenges looked well drawn and suited to the game, and many other challenges were extremely detailed and interesting animations. The music is both ear pleasing and addictive suiting the games quirky but quick style. It is clear that the composer of Wario Land 4 has had input on the games soundtrack using many of the noises and sounds from that game in this one. As quick and quirky as the game is, it does of course have a few minor flaws. 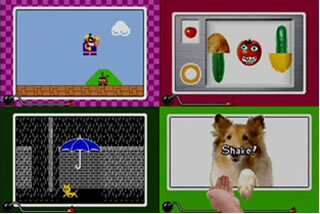 The game can at points become repetitive when replaying stages and repeating similar mini games, and also the attempt at a story being incorporated does not merge well with the game style or gameplay. Nintendo have always strived for innovation, despite falling short in many instances they always seem to produce something special, something with charm that is both quirky and original. Wario Ware Inc epitomizes this. It produces an experience for old and new gamers alike that is perfectly suited to the GBA console. Although at first it may seem too quirky and different, it provides too much fun to be looked over. A certain classic which sadly will never reach the audience it deserves.